Column vol.13 - race | Yamaha Motor Co., Ltd.
On December 6, 1973, a one-page press release surprised the motorsport world. It read, "We have been in negotiations with road-racing hero Giacomo Agostini and are pleased to announce that a contract has now been signed." GP500 world champion for seven consecutive years from 1966 to 1972 and holder of the World GP350 title six years in a row from 1968, the Italian hero of the race world finally left MV Agusta and switched allegiance to Japan'sYamaha. This was big news that entirely changed the balance of power in the road-racing world. Around that time, however, the world's industries and economies were facing a serious crisis 窶・the First Oil Shock. Japan in particular was almost 100% dependent on imported oil, and the reduced oil production and supply restrictions set off a panicked chain reaction. 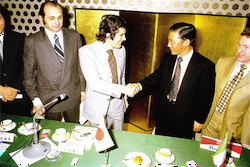 For this reason, the press conference on Agostini's signing that day in Tokyo (Imperial Hotel) attracted a large number of media representatives highly interested to learn about the stance of Yamaha Motor, a Japanese motorcycle manufacturer and major corporation. "The various conditions we are facing are very challenging, but as a motorcycle maker intent on expanding the robust world of motorsports, Yamaha will not suddenly rescind on a commitment that has won it the hopes and support of large numbers of people around the world. Regardless of whether we win or lose, racing offers the major return of being able to make big advances in the level of our technology. Our task as a manufacturer is to serve society by constantly raising the quality and value of our products. And we will always maintain our stance of seeking the technology that will allow us to do this, whatever the situation. The signing of Agostini is an expression of those two basic commitments." Yamaha's reasons for staying with racing can be illustrated with more specific examples. In 1973, Yamaha had formed a factory team after a hiatus of five years and entered World GP500 racing for the first time. While Yamaha could not help but withdraw from the GP in the wake of Jarno Saarinen's tragic accident, it had clearly demonstrated its ability to take the title with back-to-back wins from the opening round. Then in 1974, with the development of the TZ750窶把onducted in tandem with that of the YZR500 World GP factory machine窶蚤lmost complete, Yamaha decided to debut the TZ750 in the US Daytona 200 and release 200 of the machines on the market. Aborting the development of the YZR500 and TZ750 machines halfway through would have betrayed the hopes of enthusiastic fans and wasted the time and money invested in them to that point. Therefore, Yamaha took an aggressive rather defensive stance and chose the path of devoting all its resources to ensuring victory on the racetrack. Agostini was the trump card intended to ensure victory. For the first time, the normally cheerful and smiling Agostini was unable to mask his tension at the press conference. He commented seriously: "With its high level of technology, Yamaha will bring me even greater glory, and I will win for Yamaha. We both bear a great responsibility to each other. That is an extremely serious matter." On March 10 of the following year, Agostini entered the Daytona 200, his debut race with Yamaha. Right from the start, Agostini rode superbly in controlled of this tough long-distance race contested by 80 big machines. After the final refuelling on the 36th lap, Agostini held off Kenny Roberts behind him in 2nd place (also on a TZ750), Don Castro in 4th and Teuvo Lansivouri in 5th to fly across the finish line in great style to claim the win.